Kaiman woke up to find two startling facts: (1) He has lost his memories and (2) a magic user has transfigured his head into that of a reptile’s. He thus set out to hunt down magic users lurking in “The Hole” to find clues about his past and hopefully undo the curse placed on him. Upon catching a magic user, he would unceremoniously chomp down on their head, hoping to find out who it was that put him in this state. 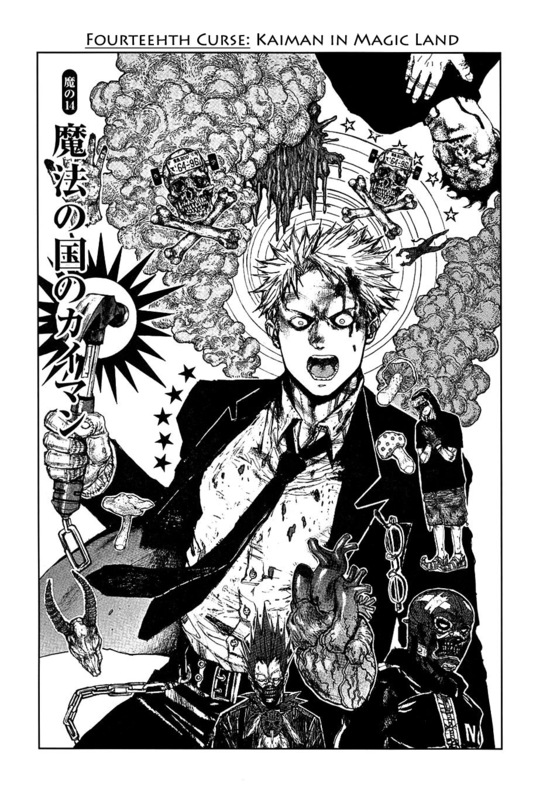 One by one, they witness this “second man” inside the head of Kaiman, and after pulling them back out of his mouth he asks them all a question “What did the guy inside my head say?” So begins a series of darkly comedic and trippy actions that is … Dorohedoro! In this series, magic users are beings born with a certain organ in their bodies that allow them to use magic in the form of puffing out smoke, be it from their fingers or mouth. On the other hand, you have the regular humans who live in a place called the Hole, which is shown to be a ghetto-ish area. The story thus follows two main perspectives, the first being that of Kaiman and Nikaido having their little adventures in the Hole. The second focuses on Shin and Noi, two magic users who are tasked with tracking down Kaiman. This is later expanded to include En’s family and the inclusion of several other factions and groups. As the series continues, the viewpoints begin to converge as the different characters meet and interact and yes, this is a manga with a relatively huge cast of characters. According to Wikipedia, Dorohedoro is serialized in Ikki, a magazine that “specializes in underground or alternative manga”. And it indeed is alternative for it is hard to find a manga as quirky and stylish as this. Trying to write a review to explain why this manga is just so addictive is rather difficult as much of its charm lies in its visual styles. For a start, I really dig Hayashida Q’s sketchy style which nicely complements the dystopian bio-punk. Really, trying to categorise this title under a genre is not easy. Manga Updates tagged it with a Biopunk, but it too has the elements of Gothic in its ambience. 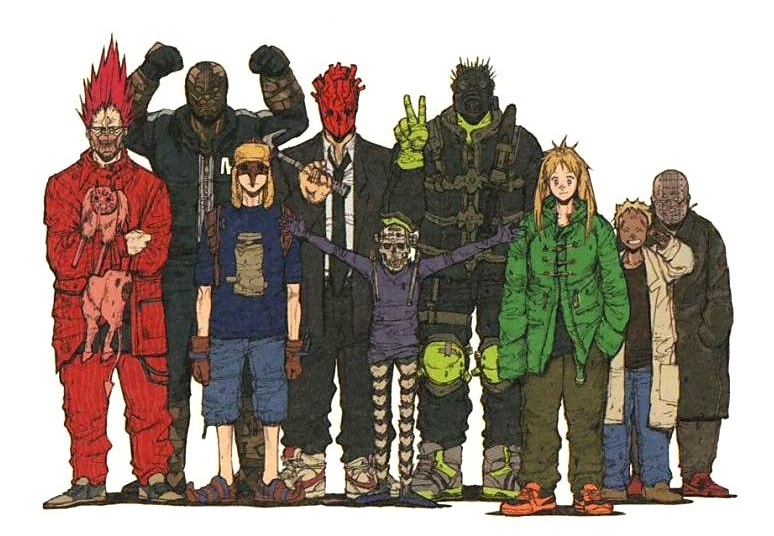 The only way I can succinctly describe Dorohedoro in one sentence would probably be that it is akin to what it would be like if Tim Burton and Quentin Tarantino collaborated to produce a manga. It’s not the best description I’ve got, but I think the analogy fits pretty well. In the Magic Users’ world each Magic User are obliged to wear a personalized mask to mark their identity. Throw in the fact that you have manifestations of curses, devils and death god flying around and the place is like a much more macabre mash of Halloween Town and Beetlejuice. And then you have En’s family and his estate. En’s family being clad in suits make it a like the mafia in a Halloween party. In fact, when Shin and Noi first turned up, I was strongly reminded of Jules and Vincent from Pulp Fiction. The whole imagery is bizarre, but it is also freakishly cool. In general, I am not a fan of gore. Titles such as Berserk and Gantz are far from my preferred types of manga and I tend to be averse to manga that displays excessive amount of gruesome disembowelment like Shigurui for example. 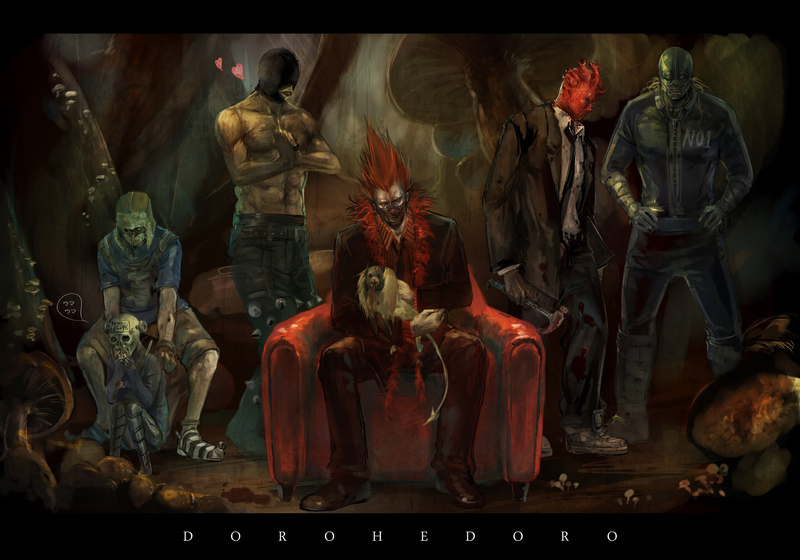 What I do have however, is a rather twisted sense of humour, and Dorohedoro pretty much struck a chord with me despite the display of characters getting brutally murdered – hell, there’s even a character whose magic is all about disemboweling bodies. Yet within the bleak setting there is sufficient amount of well executed comedy. The gratuitous amount of stylised violence as well as the general nonchalance in attitude towards its delivery by the cast of eccentric characters means that although the tone is grim, it is at the same time funny. The humor style is more towards the dry sort though. Now, simply having great visuals is of course not enough for me to consider this as one of my favourite. The characters too need to actually be interesting. Since this is after all a rather Gothic story with some rather grim setting, it should come to no surprise that trying to categorize them into “villains” and “heroes” is rather pointless. Heck, considering that the different groups get their own share of characterization and screen time, it is also not easy to distinguish between some of them as “protagonists” or “antagonists”. In other words, despite the large cast, the core characters remain interesting while the other supporting characters too get their fair share of spotlight. The result is that even though the characters are supposed to be opposing against each other, I can’t help but root for some of them all the same. Lastly, not to forget the trippy elements that goes in several parts of the manga. For the most part, the story is pretty straightforward, but as the plot progress, or rather in the recent volumes, there are certainly quite a fair bit of mind screw going on – the macabre art style definitely helped in enhancing the effects. 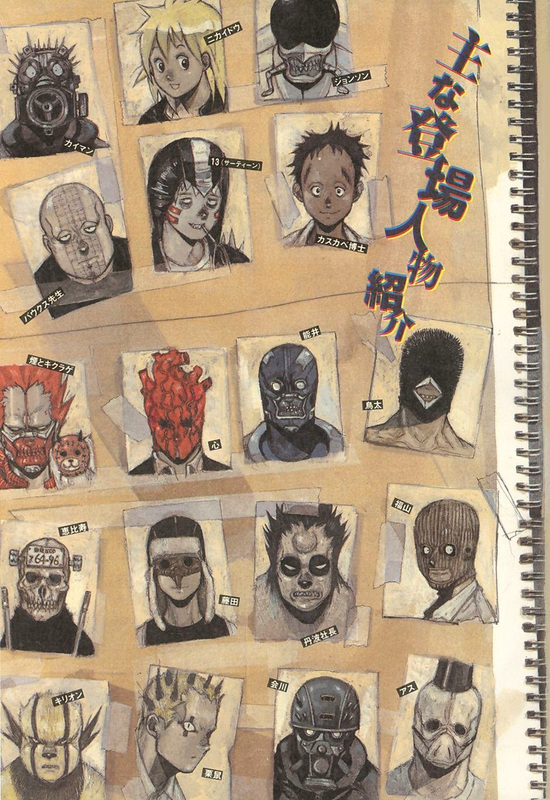 In a way, one of the things I like about Dorohedoro is also what made me took a liking to Narita Ryougo’s works in the first place: the inclusion of multiple viewpoints and what is at first glance seems like a very chaotic story, as nicely summed up one of the characters in Baccano!, “Depending on who you place in the same situation, the characteristics of said incident change kaleidoscopically. In other words, there is one incident. However, there are as many stories explaining it as there are people involved in it.” — Gustav St. Germain (aka that guy voiced by Norio Wakamoto). On the whole, Dorohedoro may take a while to get into and feel comfortable with its surreal style, but once you do, what you have here is one wickedly engaging manga. Categories: Manga | Tags: Biopunk, Dorohedoro, Gothic, Hayashida Q | Permalink.